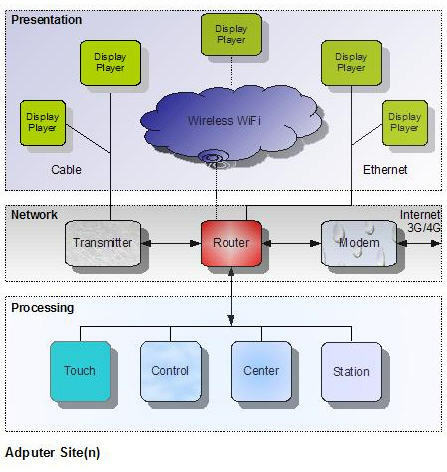 Adputer Network for Digital Signage connects Adputer Player, Adputer Station, and LCD Display altogether through WiFi, Ethernet, 3G/4G, or DSL/Cable Broadband Internet. An enterprise may wish to add digital sign display and integrate into its LAN or WLAN. Unlike IT data network, digital signage network also requres high bandwidth for video streaming, remote system control, and content management. So digital signage network needs high-performance player, fast network, and large storage server. Adputer Network consists of Adputer Player HD, Adputer Server HD, and Gigabyte Ethernet or Wireless-N Network. Adputer Player HD is a super powerful digital signage player. It can play Full HD 1080p video, stream video through the Cat5e/6 cable of Gigabit ethernet or Wireless-N dual-band network. The gigabit switch and gigabit dual-band router are required to construct a high speed digital signage network. A bridge can connect two sub-network together. Tegabyte storage with RAID in the server can work for media storage. It is best to select Full HD 1080p LCD display for Digital Signage. Usually current 42"+ LCD HDTVs are 1080p enabled. Adputer Inc. can help a company to integrate Digital Signage into its current enterprise network. So a company can promote its own brand and show services in its office space. Digital Signage is supposed to attractive customers with visual advertising and bring them pleasure experience. Unlike billboard, in a restail store customers may watch Digital Signage in a short distance within 2 meters. This makes distinctive difference between Full HD (1080p) and Regular HD (720p) for viewers. Crystal clean Full HD video makes customers feel visual comfortable so it can increase the value of a DS system and get high ROI. Since everything must be Full HD capable in the content, system, and network, we need to design the solution in high performance within affordable cost. Current development of technologies make Full HD DS affordable by using Adputer™ Solution. Adputer™ Full HD Broadcasting includes several steps: Capture, Processing, Delivery, and Display. Full HD camcoder had been widely available in reasonable price. Still digital camera has been 10MPixel more (5x Full HD resolution) as well. Today we can easily capture Full HD videos and photos. By using quad core CPU and hundreds core GPU, Adputer™ Station can implement real-time Full HD processing. Adputer™ Compositor software can composite Full HD content and advertising instantly from multi-channel video sources. In network, Gigabyte Ethernet can deliver Full HD video in longer distance in security. 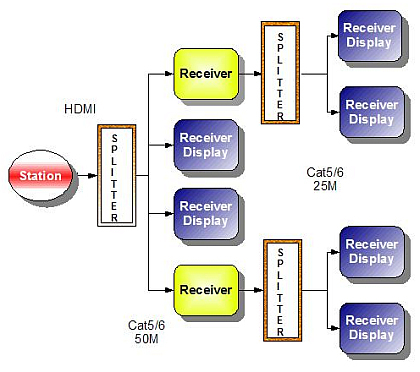 The homogenous Full HD network can broadcast Full HD video stream from Adputer™ Station to all the display on the network. In contrast current HDTV cable and satellate broadcast are only 720p HD. Finally, 40 inch plus HDTVs are almost in Full HD. The price of 40" plus large screen has dropped down dramatically. User can purchase their own PCs satisfited Adputer™ Station's requirements. It is used for real-time Full HD video broadcasting and advertising.